Kenisee Lake Thousand Trails at Jefferson, Ohio has a lot going for it. There are many nice campsites. The big rigs have some really long pull through, 50 amp, FHU sites that are out in the open. There are also a number of back in sites suitable for most any sized rig. Other areas of the campground have more trees. Most of those sites are 30 amp FHU sites. Many are big enough for bigger rigs, but are popular with those with smaller rigs. Kenisee Lake is an unusual Thousand Trails in that campsites are assigned rather than the usual pick-your-own site approach. It works here because those with larger RVs are happy to park in the big 50 amp sites. Those with the smaller rigs are happy to park in the prettier sites near the lake. Everyone likes the set up with people being assigned suitable sites. If there was a mixture of FHU and W/E only sites there would be a lot of pushback about this campground breaking with the Thousand Trails first-come-first-served policy but as it is people are okay with this approach. It might be worth noting that the big rig portion of the campground has no restroom or bathhouse. Also, as is the rule rather than the exception, there are many sites that have been sold to seasonals. See our previous review of this campground here. The main feature of Kenisee Lake is, well, Kenisee Lake – a pretty lake. There is also a small pool, nice mini-golf course, basketball court, Activity Center, and other amenities. The tenting area is more popular than we usually see at Thousand Trails. My Verizon signal was usable but not strong. Data throughput was slow but workable, especially using the signal booster. I had no problem getting satellite TV. During our stay the weather wasn’t great. It seemed to be either raining or, when the rain ended, very hot and humid. While the gravel surface of our campsite kept us above water the rest of the campsite tended to go underwater. Of course, we can’t blame the campground for the weather but it would be nice to not have to wade through water to get in and out of the RV. I don’t think, of all the Thousand Trails we’ve visited, that I’ve ever seen as active, on hands manager as Vickie. She was out and about constantly and when there was an issue with my electricity she’s the one who showed up with the multimeter to check it out. We like Kenisee Lake and will happily return here on future trips across northeastern Ohio. 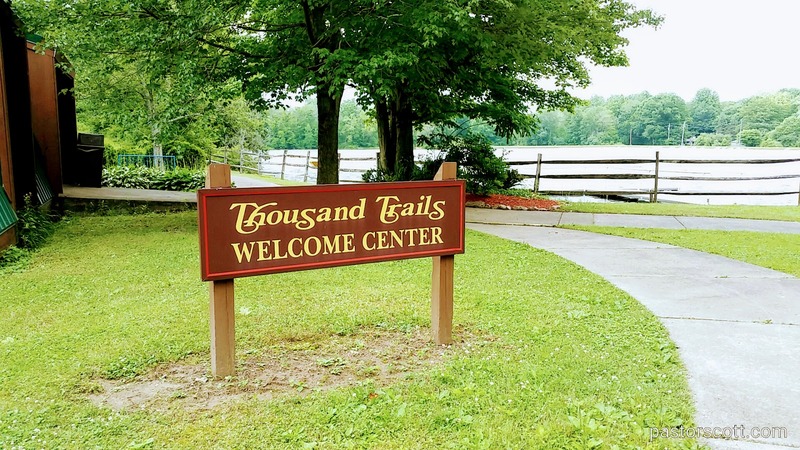 This entry was posted in Scott and tagged camping, Ohio, review, Thousand Trails, weather. Bookmark the permalink.